Former five-star quarterback Justin Fields is transferring to Ohio State. Fields made the announcement on Twitter Friday evening following multiple reports that surfaced earlier in the day. 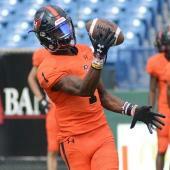 The move had been rumored since it became public that Fields would be transferring from Georgia following his freshman season. Fields will be enrolling at Ohio State for the spring semester, which will allow him to participate with the team in their offseason program and during spring practice this year. Oklahoma, Florida State and UCLA were reportedly also being considered by the former five-star prospect. What may have given Ohio State the edge was Fields' relationship with current Ohio State quarterback Dwayne Haskins. Both players train with Quincy Avery, a QB coach based out of Atlanta. Fields was the No. 2 overall player in the 2018 recruiting class according to 247Sports' Composite Rankings, finishing behind current Clemson QB Trevor Lawrence. He did not win the starting job in Athens, however, as Jake Fromm held on to the position all season long. Fields did see some time, however, appearing in 12 games. He threw 39 passes, completing 69.2 percent of them for 328 yards and four touchdowns with no interceptions. He also displayed his abilities as a rusher, carrying the ball 42 times for 266 yards and four touchdowns. With Fromm returning for another season, Fields would have had a difficult time supplanting him from his starting role, and rather than wait another year, he decided to look for greener pastures elsewhere. Of course, nothing will be guaranteed to him at Ohio State, either. Haskins has yet to publicly announce his plans for 2019, though most expect he'll enter the NFL Draft. That would leave Tate Martell as the likely favorite to land the starting role for Ohio State in 2019, especially since Fields will likely have to sit out the 2019 season due to transfer rules. Odds are Fields will appeal that ruling, but there's no way to know if he'll win the case. Ohio State also has Matthew Baldwin, who was a four-star QB in its 2018 class who redshirted this season.